Aphasia is a communication disorder that affects a person’s ability to process and use language. It is a neurological condition caused by damage to the portions of the brain responsible for language, and it does not affect intelligence. Because language plays such a central role in our daily lives, aphasia can make it challenging to communicate with others. Individuals with aphasia may find it difficult to speak, understand speech, and read and write. With the help of Lingraphica's Aphasia User Group, we've gathered some of the best ways to communicate with someone with aphasia. Keep these tips in mind next time you meet someone with the condition. Speak slowly: Slowing down your rate of speech can help someone with aphasia understand what you are trying to say. Use a pen and paper: Often times a message needs to be delivered in multiple ways. Adults with aphasia report success when someone uses a pen and paper to draw, sketch, or even write out a message. Ask for permission: Although a word may not come to mind immediately, ask the adult with aphasia for permission before you begin to help him or her. Disrupting his or her train of thought can cause more frustration. Recognize assistive technology: An adult with aphasia may rely on a communication device to communicate a word or phrase to you. Be patient and wait for them to communicate this with you. Remember that aphasia is a loss of language, not intelligence: Aphasia is a language disorder, not a reflection of someone's intelligence. Many people think that by dumbing down words or speaking louder, their message is conveyed more clearly. This isn't the case; although speaking slowly can help. Speak to me: Many adults with aphasia say that doctors, neighbors, friends, and even family bypass them and communicate messages directly to their caregiver. While a caregiver may be present in a conversation, it's important to speak directly to the person with aphasia. Be patient: It can take time to formulate a sentence or thought. Be patient as the adult with aphasia does this. Eliminate background noise: Turning off the television, the radio, or other background noise can help the adult with aphasia focus on the conversation at hand. Reducing excess noise can help him or her remain involved in the conversation. 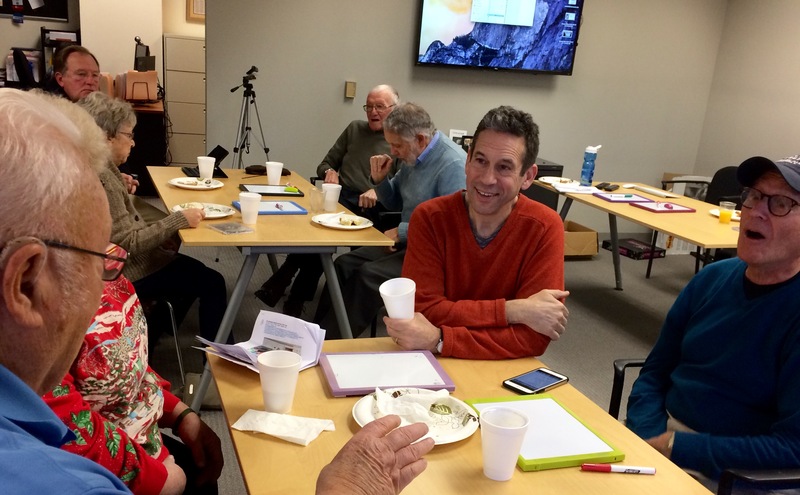 Encourage Independence: Adults with aphasia wants to regain their ability to speak. Allow them to do this by offering encouraging words and independence in social settings. This can help build confidence. Practice online: Social media sites are perfect for adults with aphasia. The ability to post a message in a variety of media forms makes it a great forum for adults with aphasia to build relationships with others. Whether he or she wants to communicate instantly or decides to take their time crafting a message, social media allows for this to naturally take place. Try these tips the next time you meet someone with aphasia! If you have another tip to share, post in the comments below. Looking for more communication tips? Download our free tips sheet!